Billy is 40 years old.. In IKEA terms, BILLY is quite a well-known piece of furniture. With 40 years of history behind it, there’s been a BILLY bookcase (or two) in millions of homes. Now we can read on our smartphones an encyclopedia that would once fill a large bookcase. Which begs the question: if your books are just ones and zeroes in a ‘cloud’ – is BILLY out of date? There have been regular refinements as well as new colours and more options. Yet the BILLY bookcase formula has been much the same for more than a generation. And that might be why BILLY fits so comfortably into many people’s lives. We spend so much time online, yet we still need to store an ‘offline profile’ too. Those physical reminders, of who we are and what we know, need their version of a ‘homepage’. Even in this digital age, a BILLY bookcase is often the most convenient place to start. Some people buy a piece of furniture for the history and identity that come built-in. If you adapt or personalise such an item, that reduces the value. Its character is off-the-shelf and is always the same. On the other hand, BILLY is more about what’s on the inside. Not the designer label or the fashion status. BILLY is storage furniture that’s functional, flexible and modest. And that’s the point. The personality that people see is what you add. And who is BILLY anyway? Gillis Lundgren named his design after a colleague, Billy Liljedahl, who had expressed his desire for a “proper” bookcase. Actually, as Lundgren intended, BILLY can belong to almost anyone and everyone. Age, gender, interests, beliefs – BILLY crosses boundaries because it only makes one very basic assumption about you. That you have important books or other meaningful items that you want to keep neatly close at hand. For the 40-year birthday, BILLY has a new yellow colour choice and optional additions such as display shelves and bookends. Which makes BILLY even more adaptable to the ways that people want to live today. Even as the face of BILLY grows and changes, the original principles hold true. BILLY was always meant to serve its owner without prejudice. What you read didn’t matter – only that you could store it “properly”. So, whatever BILLY may look like on the surface, you can’t really know a BILLY owner until you look a bit deeper. 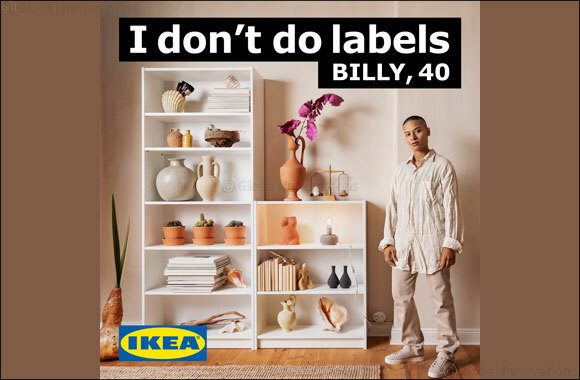 BILLY may not have the label of a famous designer.But the designer is very famous in the IKEA world. Gillis Lundgren was one of the first handful of employees and company founder, Ingvar Kamprad, backed the BILLY idea. Lundgren’s affordable bookcase would suit many different people and many types of living spaces. Lundgren knew that people might also want to add to BILLY as their book collections grew. So he made a timeless product that could rise above changing fashions and remain a cornerstone of the IKEA range. Even if it were the books that went out of fashion. For February, you can more easily display, hide and organise your treasures with the blue, red and green BOTTNA range of inserts.These complement BILLY and include display shelf and bookend options. humble bookcase finds a starring role in everyday life.